Youve Been Reviewed: If you are looking for the best crab cakes, you need to head to Maryland! If you are looking for the best crab cakes, you need to head to Maryland! You may not know it, but I’m a Maryland crab! That’s right, I was born in Baltimore and lived there the first 10 years of my life. Even after moving to New Jersey we continued the trek back and forth between home and Baltimore since most of our relatives lived there. 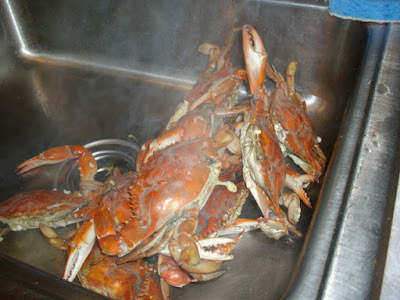 So, to put it bluntly, I know crabs – I know how to pick crabs and I sure know how to eat them. My parents had a summer home on the Chesapeake Bay on an island. Tilghman Island is a small fishing village and when I say fishing it’s basically crabs. It used to be just a place for the locals until someone from New York went there, found all the great seafood places, wrote about it the Times and all the tourists started heading there. Fast forward many years and now there are 2 million dollar homes on that island and even the tiny remodeled homes are going for unbelievable prices. There are several outstanding restaurants and you can’t beat Tilghman for southern hospitality. You might not believe it, but they have quite a southern accent! He's not a real crab so he can't pinch! While you can buy crabs in many places, the Maryland Blue Crab is known far and wide. The Eastern Shore of Maryland isn’t the only place to find a great seafood restaurant. I came across an article that lists the top 15 restaurants serving the best crab cakes in Maryland. Instead of reinventing the wheel listing them I am providing the link right here. Remember, we all have our opinions of what is the ‘best’! If you live in or near Maryland or plan on visiting – you might want to sample a few crab cakes. I know that my mouth has been watering since I clicked on the link! I wish it wasn’t such a long ride or we would be on the road right now! A great crab cake starts with fresh crab meat. The best way to get that is by catching the crabs yourself, steaming them, picking them and then making crab cakes. Since that isn’t possible for most people, you can buy crab meat in your local grocery store. The recipe for crab cakes is right on the pack of Old Bay Seafood Seasoning. I won’t say that store bought crab meat will taste as good as Maryland crab meat, but if you can’t get to Maryland using store bought crab might be as good as it gets.